Seven months ago, after MANY hours in labor, you were out in the world... and I was TERRIFIED of you. Now... I'm just terrified that you're going to be mobile soon. So for now, I will wake you up early, when you're still sleepy, just for the chance to snuggle you again. The way we did for hours on end when you were just a wee lad. I love you so so so much. Happy seven months birthday my little bird. Agent Jenipher reporting for duty. Alternate task: writing this blog. After a long, semi-miserable Tuesday last week I spontaneous (and guiltily) purchased a Baby K'tan so I can conduct some mean baby wearing magic. An amazing client of mine gifted me four carriers but this little nugget is only 6lbs and none of the carrier could accomidate him. NOTE: Most carriers need the kiddo to be 8lbs. I took to the internet (aka: I asked the two mom fb groups I'm in) and the comments poured in, mostly about how I purchased the incorrect size. Boo. I am a small lady, and purchased an XS which barely fit my husband. I couldn't IMAGINE spending $50 on something that he couldn't wear too, and surely an XXS would NOT fit him. Readers.. I don't know if you believe in God, the Universe, whatever, but a blessing of a PM came through while the fb comments were still pouring. In "walks" Abigail. My new friend Abigail told me she met me at the Dunedin Farmers Market, that she had two Solly Baby wraps she was going to give away, lives in my town, and could come over RIGHT NOW to show me out to use them. Now... normally, dear readers, I DO NOT let complete strangers come to my house, especially when there is a nice enticing family nap about to happen. But after a brief FB stalking, I said "sure come on over stranger" to nice nice Abigail. 1) you NEED a wrap/carrier so you don't go insane when you have a newborn. I'm pretty mean to myself... I always have been... but usually I know what the triggers are. I'm used to having some bad thoughts. And I'm used to having ... or well... KNOWING my strengths. And my general life consists of both of these on a daily basis. Scratch that... my life DID consist of both of those. There is NO time for my strengths with motherhood right now. There is no time for drawing most of the time, or marketing, book writing, goal planning, dreaming right now. There is just baby. Most of the time awake, often crying in my presence baby. And it's draining me. Motherhood is bringing out the worst thoughts. I'm not "good" at this. This isn't coming naturally to me. And I constantly feel like I'm failing. The hardest one as of late is wondering why *I* can't put him down to sleep. My husband doesn't have this problem... just me. It's ME. Something's wrong with ME. I can get him to sleep. On ME. The moment I put him down though, he's crying. It's completely debilitating. And exhausting. And I often feel like a TERRIBLE TERRIBLE human because I want SO badly to get something done, just for me. Just a tiny thing. But I'm often either too tired, or too mushy brained to do so. I feel guilty for not just enjoying my baby. Enjoying this time with him, since it will float away right before my eyes... but I don't know how to turn off my brain enough to just BE. Hope you're having a beautiful day friends. So.. CRAZYPANTS... my baby boy is almost a month old. I was induced one month ago yesterday and he'll be born in two days. So.. story time! When my Great Aunt Kiki was in her late 90's, she used to tell me how fast time goes by. It seemed crazy to me. How can someone who never left their house or changed out of their night gown STILL think time is flying by everyday?? Obviously the older you get in life, the more true this feels, but it's never felt TRUER until I had a baby. I feel like most days I'm straight out of the Groundhogs Day movie. Everyday honestly feels like it's ONE BIG DAY and I can't even remember to do the simple things I'm supposed to do. Yeah, I totally forgot about those "today". The hours just fly by, most without any napping on either of our ends, and then the day is over, and I realize... HUH, well you forgot to do everything today. It's just insane. I realize my child is totally normal and that the below is nothing short of an average life of a baby, but just incase, here's the exciting LIFE OF A (almost) ONE MONTH OLD. My little boy loves being swaddled, although he's HOUDINI!!! and his arms never stay in them long. Even at the hospital the nurses (who wrap like super ninjas) couldn't always keep his arms in. As of this week not even his legs stay in them. And then he's angry his legs are out. His logic doesn't make much sense to me. It's pretty much the same situation with the binky. His hands move a mile a minute and he knocks them out and then gets angry. It's HOURS of fun!! All in all, he's a pretty amazing baby. Aside from tons of throw up this week, and inconsistent sleeping, we're pretty darn grateful. If all goes to plan... I really wanted to share my induction story today, we shall see how my little bird does on the sleeping front when we get back from the doctor. So I will start off to say it has proved very difficult to keep blogging now that my husband is back at work. I'm just getting WAY less sleep, and doing things all by myself during the day has taken it's toll on me. One night when Ollie was about four or five days old I woke up at 2am for his feeding and he couldn't open his right eye. Why was my babies eye SEALED SHUT!?!?? He was opening his left eye and not his right!!!!! HOLY CRAP WHAT IS HAPPENING?!?!? After a few moments of feeding my VERY hungry baby, I couldn't STAND it anymore and I ran to my bedroom to wake up my husband. He told me it's okay and to use a little washcloth and after I did it was better. But I was SO SO SCARED. The doctor said this is totally normal. Babies don't produce tears and instead sometimes produce yellow gooey's. Oliver is 3 weeks old now and his eyes are still ALWAYS gooey. We go though tons of wash cloths, but at least this is "normal". 2. Babies make SO MANY noises!!! Like, for hours. While they are sleeping! What the heck?!?! Why didn't I know this?? This is the hardest part of motherhood for me. I can't sleep near him, which is quite the predicament because I'm alone most of the day which means I get no sleep. He wakes up so consistently that I feel like every time he makes a noises it's him waking up - he squeaks, he cries out randomly, grunts, and then my favorite, the little bird noises. But becuase of said noises, I feel like 90% of the time I’m on edge waiting for him to wake up, even if he's just making random baby noises WHILE he's sleeping. My husband doesn't seem to have this problem though. - Put toast in the toaster and BAM when it's just ready to come out, he cries. - Heat up noodles in the microwave and TA DA he's ready to be held. So now you know... incase you're in a situation and you WANT your baby awake so you can leave the house, just remember your good friend Jen and make cinnamon toast. I was never afraid to share... until I became a mom. It's funny, because if you look at my internet life, it's VERY similar to my regular life. I'm SUPER honest - I always have been, and I've always prided myself on being vulnerably honest in hopes it might help someone else who's struggling with the same thing. But something about being a mom... people attack moms. Mom's attack other moms. And I'm scared of being attacked. So I've been scared to post for the last few days. But I'm not going to stay scared. I am a FIRM BELIEVER that SHARING IS IMPORTANT. But please, if you are reading this, even if you don't like what I'm saying... please keep mean thoughts to yourself. Today is my due date!! Okay well it was technically yesterday, but it's 4am again so let's just pretend it's not May 18th yet, okay?? So May 17th was originally my due date, but IRL Ollie's actually been born for two weeks (and one day!) already... how insane?!?! Today was also my first day taking care of Oliver alone while my husband went to work. Eep! To say I was TERRIFIED is an actual under statement, but the day went well, and I am very grateful. Aside from a POOP-SPLOSION diaper and then a really great nap afterwards, I had a women come over from "Heathy Family Florida". When I was in the hospital, I had a LOT of panic attacks, and a lot of people came to check to make sure I was stable. One of those people were advocates of "Heathy Family Florida", which sounded pretty enticing at the time. Lastly... I painted for the first time in OVER 9 months. YAY! So yeah.. QUITE a day here. Let me tell you about PELICANS! Want to know a way to REALLY CONFUSED the nurses at the hospital???? As you know, I had to be induced. There's a few ways to get induced, and the way I thought I was going to get was a little pill they insert "in your lady friend" every few hours to open your cervix. Fun right? Yeah, well what's even MORE fun is having a balloon shoved in there to open your cervix right?? Or even better, having THREE different kinds of balloons since none of them will..."fit"? (Now THAT'S a party!) Seriously y'all, this way of being induced (for me) was SO. VERY. PAINFUL. And the fact that it was SO painful, and didn't work so they kept having to try different ones was ... well let's just say I had to SHOUT in agony. But it wasn't profanity I shouted. The nurses laughed, and were SUPER confused by this. They said they thought they've heard everything, mostly profanity, but NEVER heard someone shout "pelicans". The thing is, that I was trying SO HARD to think of something wonderful during the pain and I just love watching pelicans dive into the water. (We live by a pier so we go to see them all the time. lol) So, naturally, that's what I shouted while getting three different types of Foley Balloons put inside me. Overpacking is an art form... right? I have a handful of friends who are about to deliver, so I thought now would be a good time to talk about what I found most helpful to bring to the hospital with me. As a SUPER anxious person... and as someone who is TERRIFIED of doctors/hospitals I SCOURED the internet and mom suggestions on what to bring to the hospital. And I COMPLETELY overpacked... BUT I will say I'm still glad I did. I like to be prepared, and I liked that I was as comfortable as possible while I stayed at the hospital. Especially since I was there for at least four days. I also asked mom's who gave birth at that hospital what they liked or disliked, and I made sure to pack EVERYTHING they suggested too. They said the robes were itchy, so I packed my own. One friend said she's glad she brought two pairs of slippers b/c she lost one, so I made sure to bring older slippers incase *I* lost one. A friend who had an emergency C suggested to bring clothes you can wear that don't touch your stomach stitches so that went in the bag too. All and all, I DID indeed overpack. BUT I'm still grateful I had everything in case. Here's a list of 10 things I would bring again. I also brought a book (which I did not have the energy to read), my ipad (same) and playing cards (which we did play after I had some drugs in me lol). 3. I was FREEZING in the hospital gown and by the fourth day there I was glad I had my comfy robe. Wish I put it on sooner though! 4. My own water bottle - through the whole process I was THIRSTY and the one at the hospital was HUGE and heavy and mine was easier to use, especially during delivery. 5. Chapstick!!! You will need chapstick so bad! Especially if you need an oxygen mask during delivery like I did. 6. MUSIC WAS IMPERATIVE!!! The best thing I ever did right before we left the hospital was made a play list. I listened to music the whole time I was there, but had a special "Ollie COME OUT!" playlist for when I was in labor. Somehow, by the grace of God, I was able to sing in between contractions during labor, oxygen mask and all. Sleeping is a Catch 22. It's 3:30 and the baby isn't even "awake" yet... but he's so fussy I can't handle laying in bed next to the bassinet while he's making so many discontent noises while he sleeps. Instead, I'm writing blog posts in my head while uncomfortably being horizontally "on my toes". I know we're "supposed to" sleep when the baby sleeps, but it's like sleeping next to a ticking time bomb and I just... can't handle it. I just lay there ready to pounce like a mama tiger, even if he's going to end up sleeping for hours. It's kind of torturous to be honest. I'm so curious how other moms handle this... if you're a mom and reading this.. please let me know!! It's been one week since we've been home from the hospital. 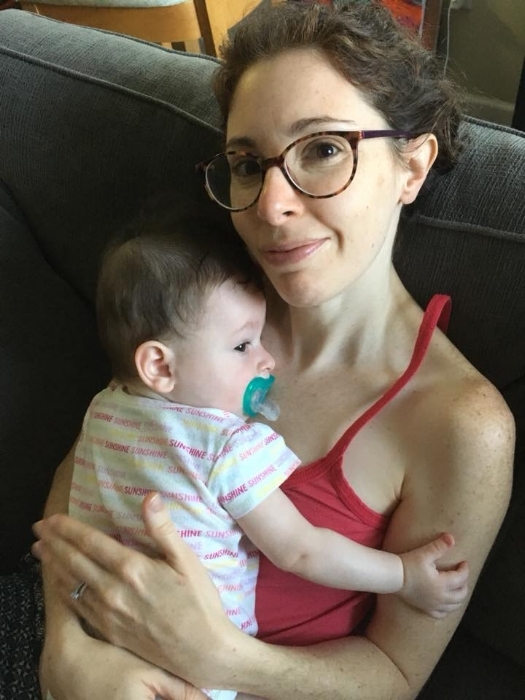 (well, technically it will be a week at 5pm but I digress...), so I wanted to share some of the things I learned in this first week of mommy-hood. 1. Have some bottles on hand just incase. You never know if you'll have to formula feed if your milk doesn't come in. Or, in my case, if your baby can't latch. 2. THIS cloth bassinet is amazing!! I want to buy a 2nd one to put in another room. 3. Clothing with little hand mittens attached are a staple. 4. OUCH, peeing hurts. Make sure to take the squirt bottle they give you at the hospital. Motrin, and witch hazel pads help too. Yeah.. so didn't know this was a thing. What are YOU going to award yourself for this week? After the Panic Attacks... are more Panic Attacks. So, yesterday was my my little bird's one week birthday. Eep! Already? Feels like less and it also feels like MONTHS. lol. It also marks being home from the hospital for 5 days. I had so many panic attacks in the hospital, but I didn't expect to have as many here at home. (call me crazy) I'm having so much trouble being in the present. Just thinking about how scary the future is, just thinking about my husband going back to work next week, the thoughts take over. My mind is going a million miles a minute in FEAR. And I know it's making my husband sad and I really hate making my husband sad :( I know I need to have a mindset makeover to think about "there is" instead of thinking "there is ONLY". "There is ONLY 3 hours till his next bottle" "There is ONLY a few days until you go to work." It's SUPER hard to change your mind, especially when it's scared poop-less. But it's seriously hindering the time I have left with my husband home, the time where my baby is this tiny, and I don't want to wait until it's too late to fix it. Sending love and cupcakes out to everyone. I don't know why I feel compelled to write a blog about being a hyper sensitive pregnant lady... or mama, but it's been in my mind for WEEKS. I thought about doing a podcast about it, but this feels more "right". Pregnancy was really hard for me, mostly for emotional reasons, (but some medical) and I wanted to document the things that were hard in hopes it could help someone else. From gestational diabetes to emotional stability, from medication to induction, I want to share a realistic viewpoint from someone who had mega bad anxiety. My baby is now 6 days old today and I realized, the delivery itself and all the things that made it go a little better also might be able to help people. Who knows? ?